There are a number of beautiful Saint Martin villa rentals with late availability for Christmas and/or New Year and some even have 7TH NIGHT FREE special offers! There may never be a better chance to spend the Christmas Holidays in the Caribbean. Here’s an overview of the Saint Martin villa rentals with late availability and/or special offers for Christmas and New Year. ONLY $2,143 plus 8% tax per night! Minimum 10 nights. ONLY $6,429 plus 8% tax per night! Minimum 10 nights. Find out more about La Dacha, Baie aux Prunes / Baie Rouge, Terres Basses, Saint Martin. ONLY $4,000 plus 8% tax per night! Minimum 10 nights. 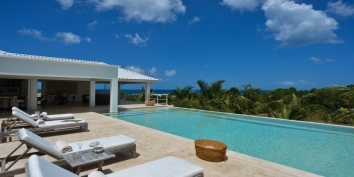 Combine a secluded and elegant split-level seven bedroom, seven bathroom, Saint Martin villa with an exquisite view of the Caribbean and the island of Anguilla, and you have the perfect place for a vacation with a large active family, group of friends or business associates. Caye Blanche is located on a hill near Anse Marcel, Saint Martin. A marina, restaurants, shops and a sandy beach are located about 1/2 mile away from Caye Blanche. Caye Blanche can be rented as a 5, 6 or 7 bedroom St. Martin holiday villa. Find out more about Caye Blanche, Anse Marcel, Saint Martin. 7TH NIGHT FREE! Available up to 28 December 2014. ONLY $17,143 plus 8% tax for 7 nights! 7TH NIGHT FREE! Available up to 28 December 2014. ONLY $16,715 plus 8% tax for 7 nights! 7TH NIGHT FREE! Available up to 28 December 2014. ONLY $12,858 plus 8% tax for 7 nights! 7TH NIGHT FREE! Available up to 29 December 2014. ONLY $8,486 plus 8% tax for 7 nights! 7TH NIGHT FREE! Available up to 27 December 2014. ONLY $6,000 plus 8% tax for 7 nights! Little Provence is a very open brand new 2 bedroom Saint Martin villa rental with a great Long Bay (Baie Longue) view, 5 minutes drive from the beach. Contemporary and comfortable furnishing. Each bedroom features a king size bed, air conditioning, French doors and ceiling fans. Private bathrooms with showers and hair dryer. Little Provence can be rented as a 1 or 2 bedroom villa. Find out more about Little Provence, Long Bay, Terres Basses, Saint Martin. Available up to 26 December 2014. ONLY $18,000 plus 8% tax for 7 nights! Located directly on Baie Rouge Beach, this Saint Martin villa rental is a gorgeous mix of contemporary styling and Caribbean relaxation. Carisa is a fully air-conditioned villa, and has a separate media room with a 60 inch Plasma TV and top quality THX audio system both for watching DVDs (you'll swear you are in the theatre) or listening to CDs. You can play music out to the open Gazebo, the pool area, or even listen to it in the raised heated Jacuzzi. Find out more about Carisa, Baie Rouge Beach, Terres-Basses, St. Martin. Available up to 27 December 2014. ONLY $28,000 plus 8% tax for 7 nights! A quintessential four-bedroom beachfront villa, Casa Cervo provides the perfect combination of privacy, comfort, and luxury within the gated “Residence Baie Rouge” community of Saint Martin. As you drive through the large grey gates of Casa Cervo, the third to last home from the far west end of Baie Rouge Beach, you enter a perfectly manicured garden oasis. The circular driveway offers plenty of parking and leads to the main walk-up entrance to the villa (14 stairs to be exact). Find out more about Casa Cervo, Baie Rouge Beach, Terres-Basses, St. Martin. Available up to 25 December 2014. ONLY $125,950 plus 8% tax for 7 nights! Our latest "Dream" : An eight bedroom non-smoking villa on a private beach area on Baie Rouge Beach, Saint Martin. Dramatic architecture from the entryway to the beach. Ultra deluxe decor with state of the art equipment throughout the villa. The large pool and Jacuzzi are heated and there are two screened-in beachside gazebo's for massages or relaxing in the shade. Additional to the private tennis court, there is a fully equipped Gym and a Spa . The kitchen is a custom designed Chef kitchen, a cook's delight ! The living and dining areas are spacious, suitable for entertaining a large number of people . A Billiard- and Media-room for entertainment . The six master bedrooms with ensuite bathrooms are beautiful private retreats . The Villa is truly a self-contained paradise. 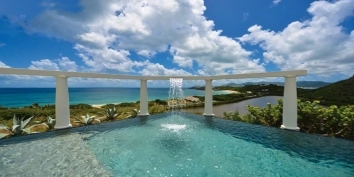 Find out more about Le Reve, Baie Rouge Beach, Terres-Basses, St. Martin. Available from 28 December 2014. ONLY $14,000 plus 8% tax for 7 nights! Available from 30 December 2014. ONLY $12,000 plus 8% tax for 7 nights! Bamboo villa is just 3 minutes drive from Baie Longue Beach, Saint Martin, overlooking the turquoise waters of the Caribbean Sea and sitting on striking landscaped grounds. This new, spacious and modern hill-side villa rental is the ideal place for those looking for leisure and convenience as it is located just minutes away from dining and night life. Can be rented as a 1 or 2 bedroom villa! Find out more about Bamboo, Baie Longue, Terres-Basses, St. Martin. NOTE: these rates and special offers are subject to availability and change at any time without notice.